Las Terrenas in the Dominican Republic is a special hidden place where miles of beach weave their way around verdant elevated points. The sands are tan in places, white in other. The turquoise waters break in white explosions offshore where they meet reef. French and Italian pioneers came to this charming little place before the rest of the outside world had found it. They came in search of adventure…the perfect beach…and friendly local neighbors to share it with. They were so keen to live here that, before the road was cleared, they traveled over the hills by donkey. They whispered to their friends about what they’d found here. More came. They brought with them European culture and great food in abundance. Today you can eat French and Italian food as good as any you’d eat in Europe right on the beach. 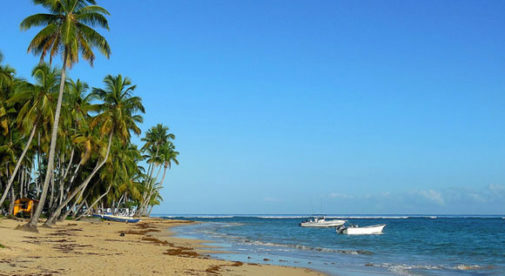 A total of 8,000 expats now live in Las Terrenas. Even today, most are French and Italian. Many run businesses in the beach town from fishermen’s huts. That’s partly down to the low-key nature of the place, but also because development is restricted. You won’t see high-rise buildings on the beach—this place is and will remain boutique. More people are coming all the time to live and vacation thanks to improved accessibility. The highway from the capital Santo Domingo has been upgraded. Flights from both Canada and the U.S. now land in El Catay airport 20 minutes away. Because there’s no big resorts, accommodation is scarce. Visitors stay in a rental condo, in one of the little hotels in town, or on the beaches. To rent a luxury beach home here, you could easily pay thousands of dollars per week. Despite the high price tag, those properties get good occupancy. Or you can rent comfortable (albeit not luxurious) conveniently located condos in town from $100 a night. Many of these are a bit dated and not quite what the hip market that’s coming here is looking for. There’s very little in between. That’s where you have a great opportunity. Though the rental market in Las Terrenas is strong, you could buy a luxury, two-bedroom, two-bathroom condo steps from the nicest piece of Las Terrenas beach for just $188,000. The yield you can generate in Las Terrenas is among the strongest on my beat. If you buy a condo for $200,000 that grosses $20,000 in rental your gross yield is 10%. That calculation even factors in plenty of time for you to enjoy and use the property for yourself. You’ll find the $188,000, two-bedroom luxury property in a little community. Through this community’s landscaped gardens you are a gentle stroll to my favorite beach in the Las Terrenas locale. Palm trees sit dotted along the beachfront. To your right the beach ends in a green, hilly point. The community is right at the end of the little road making it effectively private…but you can still walk to charming and excellent restaurants—even one run by a former presidential chef in France. The condos have been finished to the highest luxury standards, so owners tend to be the well-heeled who don’t want to let strangers use their condos. Because of that, rentals here are in hot demand and limited supply. During the North American winter, a condo here could rent for $250 per night. But, let’s be conservative. Rent for 100 nights at $200 a night and you could gross $20,000. That’s a nice income from a condo you could buy for $188,000. I gave readers of my Real Estate Trend Alert the full details of this deal—and many more like it—in recent weeks. To learn more about this deal, sign up to Real Estate Trend Alert now. This special report covers information on the 25 things you must know before buying property overseas as well as some of the best places in the world to buy real estate…and is yours free when you sign up for IL’s daily postcards below.